September 25, 2017 – Taipei, Taiwan – BIOSTAR continues to lead the way in Crypto Mining with an estimated installation of 1 in every 5 mining systems around the world; thanks to its comprehensive line-up of Intel and AMD dedicated mining motherboards, price-performance positioning and ease-of-use. 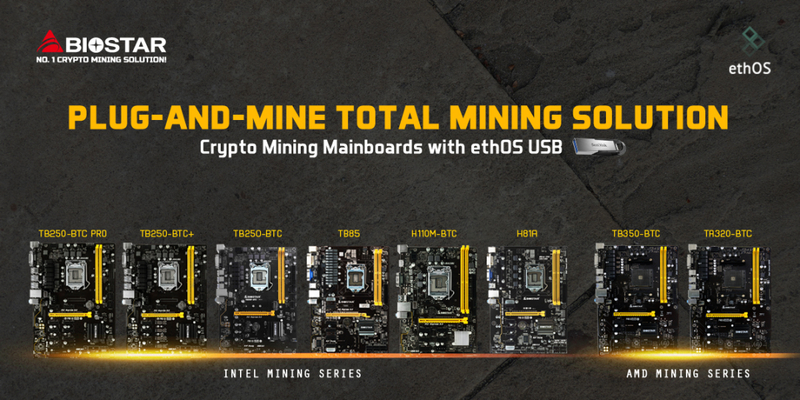 BIOSTAR now makes it even easier for miners by partnering with ethOS to create a total-solution with its Crypto Mining series motherboards and the ethOS USB flash drive preloaded with ethOS system. With the Plug-and-Mine solution, BIOSTAR brings miners an easy-to-follow, simple to set-up package, welcoming more people to join the crypto mining community. The ethOS Mining System is one of the most straight-forward operating systems for mining ZCash, Monero, Ethereum and other GPU-minable coins. The setup is simple Plug-and-Mine, without needing a SSD. When paired with BIOSTAR mining boards, building a heavy yet stable mining rig of up to 12 GPUs can be done with ease. These have been tried and tested by both BIOSTAR and ethOS. BIOSTAR offers a wide array of crypto mining-oriented motherboards powered by the Intel B250, B85, H81, H110, as well as AMD B350 and A320 chipsets offering great stability, ease of use and high return on investment. These motherboards all support heavy mining setups using 6 to 12 GPUs. BIOSTAR’s current crypto mining line-up includes Intel based BIOSTAR TB250-BTC PRO, BIOSTAR TB250-BTC+, BIOSTAR TB250-BTC, BIOSTAR TB85, BIOSTAR H81A and BIOSTAR H110M-BTC and AMD based TB350-BTC and TA320-BTC. 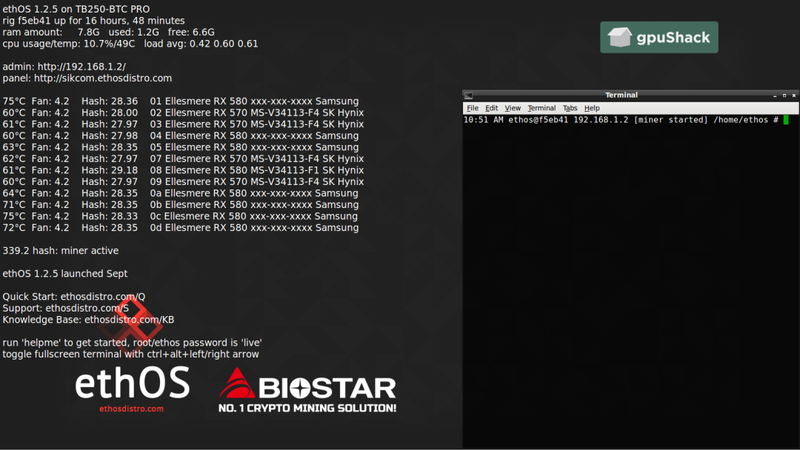 BIOSTAR continues to make mining easier with the cooperation with ethOS by providing a USB flash drive with pre-loaded OS making it Plug-and-Mine. BIOSTAR also proven its motherboards and systems are well tested for superb stability with the Blockchain Technology Lab. The Plug-and-Mine promotion starts at the end of September 2017, for more details, please contact your local distributor.